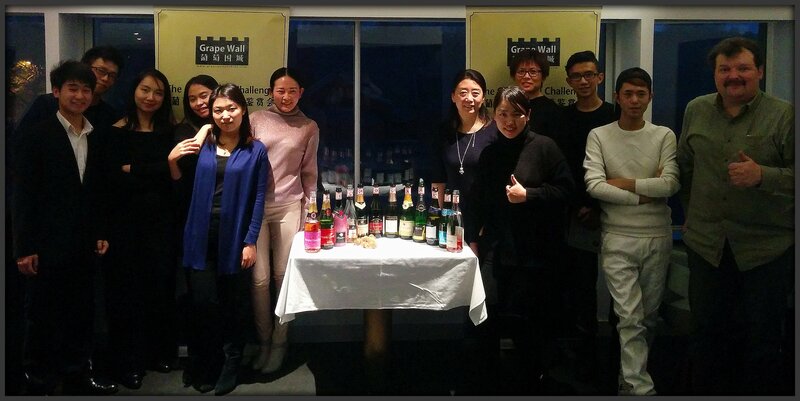 The seventh annual Grape Wall Challenge featured a battle of the bubblies as ten Chinese consumers blind-tasted a dozen sparkling wines at TRB Bites on Sunday. The judges tried wines from five nations — Australia, France, Germany, Italy and South Africa — and scored each as “love it”, “like it”, “dislike it” or “hate it”. 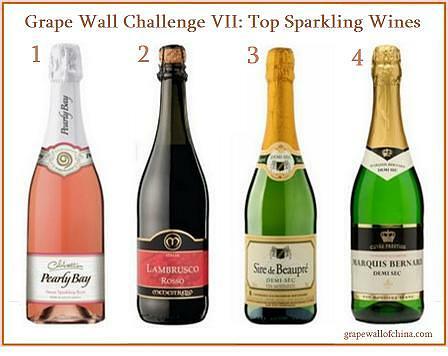 In a tight race for first place, KWV Pearly Bay Celebration Rose from South Africa edged Menestrello Lambrusco Rosso from Italy. Pearly Bay is distributed by China Wines & Spirits and is rmb98 at Mali Wine Cellar, says Alex Cros, and also listed on yhd.com and amazon.cn. Menestrello is rmb68 at CHEERS shops in nine cities and at cheers-wines.com, says David Schaumann. There was a close contest for third. Sire de Beaupre Demi-Sec from France — rmb69 in Carrefour, says Charles Carrard, with additional listings on jiuq.com and yhyyh.com — nosed out Marquise Bernhard Semi-Dry from Germany, which is available at CHEERS for rmb88. Grape Wall Challenge puts a spotlight on Chinese consumers who are casual drinkers — say someone who enjoys wine once or twice a month and has never taken a class. It focuses on inexpensive wines, typically priced at rmb100 or less, as they represent most of the market. And it leans toward wines with national distribution so more people can find them and buy them and make up their own minds. 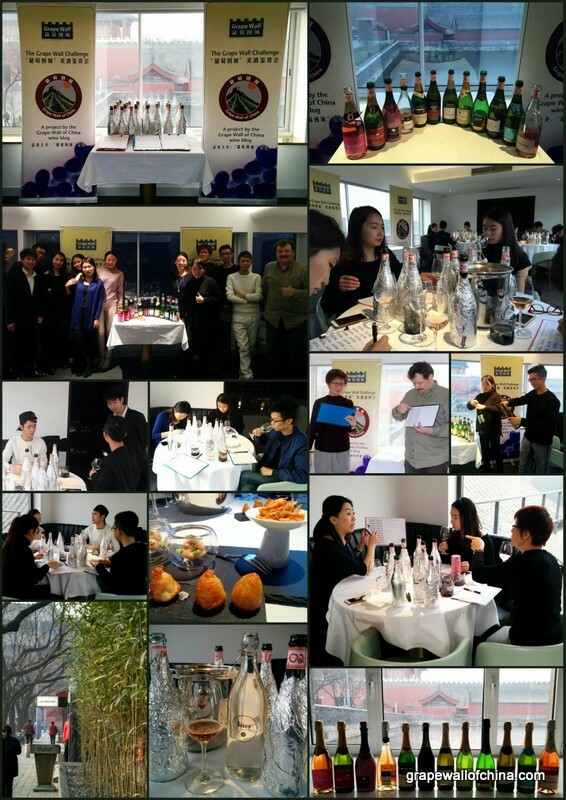 After the judges tried their hand at opening the sparkling wines, and finished tasting, Ma Huiqin, a professor at China Agricultural University and wine marketing expert, led a discussion. “Even as a wine professional, I found the Pearly Bay rose to be very nice. It was fruity and lovely, sweet and balanced, with a very attractive body,” she added. The Grape Wall Challenge, first held in 2009, is a team effort. Thanks to TRB Bites for being venue sponsor. This goes beyond providing a room with a superb view of The Forbidden City to behind-the-scenes efforts like handling deliveries, providing gift bags, wrapping wines and serving snacks. Proprietor Ignace Lecleir has hosted Grape Wall four times, including last year at sibling venue Temple Restaurant Beijing, and his efforts and those of Joce, Stanley, James and many others are appreciated. Thanks to CHEERS, China Wines & Spirits, East Meets West, French Wine Paradox, Montrose, Summergate and Torres / Everwines for providing wines. Time was tight and these importers were able to deliver on fairly short notice. They provided four bottles of each wine and we used any extras as gifts for the judges. Thanks to Ma Huiqin of China Agricultural University for leading our discussion and providing support. And last, but certainly not least, thanks to our judges for spending a Sunday afternoon tasting and talking about wine. They are Dong Fangyu, Jing Jing, Theodore Gao, He Da, Lei Dong, Colin Li, Li Cuiping, Li Qian, Wen Hao, and, attending for a record sixth time, Miao Wong. Many thanks to all!